Following on from my last post, another ‘treat day’ in London might well involve a visit to the ‘Fashion and Textile Museum’ at 83, Bermondsey Street, London, SE1 3XF. Until just recently, my sons’ office was also in Bermondsey Street, so I’ve had several opportunities to go to the museum before having a ‘catch-up’ with my sons. For example, I thoroughly enjoying the wonderfully colourful retrospective exhibition they presented of Kaffe Fasset’s work (paintings, knitwear, needlpoint and quilt designs). I also managed to see ‘Knitwear: Chanel to Westwood’, marvelling at the knitted swimsuits (they surely can’t have been comfortable?) and loving the large collection from the 1950s of patterned slip-overs in traditional patterns from the Shetland islands – which could easily still be worn today. This small museum packs a big punch. The adjoining cafe ‘Teapod@FTM’ makes specialist coffees and teas, served with cakes baked to a high standard – also recommended. The reason for me going there in November, however, was to take part on one of their excellent courses. This one was led by Jolanta Cerniauskiene, who had been Zandra Rhodes’ dressmaker. It was worth the course fee, just to watch her demonstrate her skill on the sewing machine. 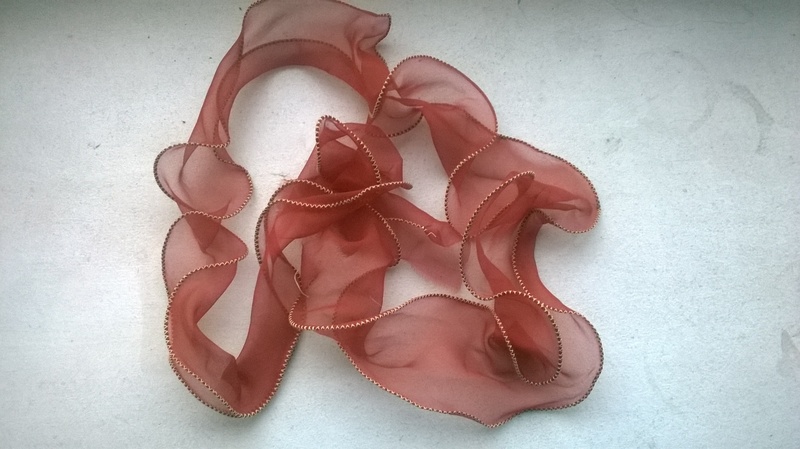 The course title was ‘Couture Techniques’ and it promised to help participants learn to ‘work with difficult fabrics’ and indeed we did: fine silk chiffon and silk satin. (Contact www.ftmlondon.org for more information.) A number of techniques were covered, including the best way of doing French seams. The time spent in the sewing room was concentrated and intense; I think everyone felt tired at the end of the afternoon, when we left with our collection of sewn samples. All the materials were provided and the fabrics were just gorgeous. Will I tell you how it’s done? No – you will have to sign up for a course! 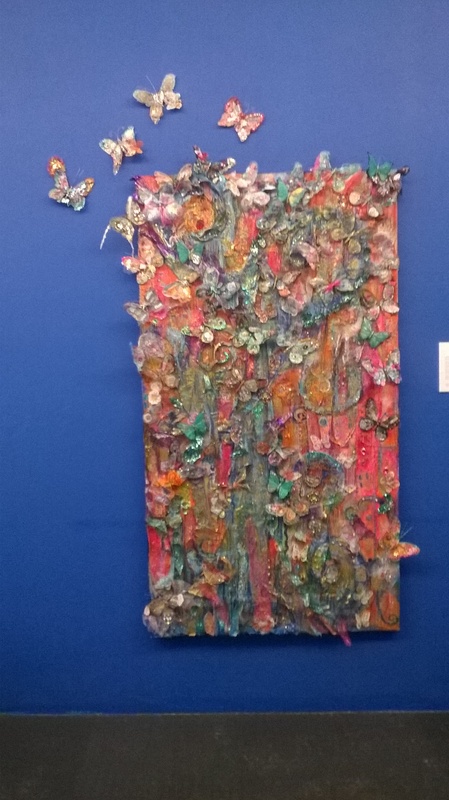 Also at the museum, hanging in the foyer, was this dramatic and eye-catching piece by multi-media artist Sharon White, working with women who had been affected by breast cancer and linked to the charity ‘Breast Cancer Care’. It is a large piece (190 x 105cm), entitled ‘Tree of Life’ and is made of bras (some of which have been autographed by celebrities). Its intention is ‘celebrating life and female strength’. It was very striking, and what a creative and imaginative up-cycling of underwear! Thanks for your comment. Nice place to eat on that street too! Thanks for your comment. I’m sure you looked lovely. Remind me to show you my photo of myself in a knitted swimming costume!!! It had rabbits on it and of course I was very young! Lovely post about one of my favourite places. I love that street.